Day 15 – Half Way Day!! Wahoo we are half way there!! Day 15 was a good one. I am right on track with my treatment. In the last couple days my hair has started falling out, but other than that have had no negative response what so ever! It must be all that positivity that you are sending me. Keep it coming!! Thank you to our friends for spending the day supporting us with the Car Wash! We definitely feel all the LOVE down here in Memphis. ← Hard Work Pays Off! Half way there buddy! Way to go! Keep up the great work we’re all doing the countdown to when you get to come home…you’re over the hump! By the way my car has not been this clean in forever. Jenn, Gigi, and Chris M. scrubbed the outside and Ali even got inside and the dashboard is shining!! I think there might have to be a JBT car wash Take 2 for anyone who missed it. You guys are really the best. Such great friends! That’s an amazing smile buddy! You’re doing amazing! “Half way” and ” got this” says it all! Making the turn and looking great!!! Keep up the hard work and NH will be in your sights soon. Very proud of you John!! John, you look fantastic!! Love that smile!!! And don’t worry about the hair, it’s summer and way too hot for hair!! Keep doin’ what you’re doin’! Thinking about you and your family everyday!! 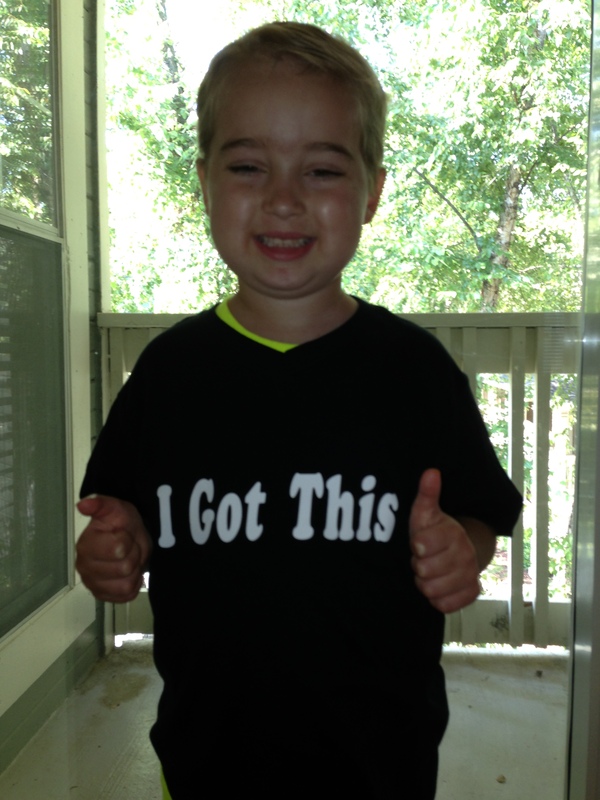 Look at that smile:)) and 2 thumbs up is right…. You are half way there brave boy, keep up the hard work!! Give your Mom a hug from the Pikes and make sure she gives you 2 right back!! So so happy! Your Memphis friends are rooting for you!! 🙂 Sooooooooooooo happy to hear! With a new cousin and 2 sisters waiting for you to be home this is super news! Hugs and much love to all! This site is intended to provide family and friends of John Bradley Thompson with information about John's fight against DIPG, as well as provide a place for everyone to share their memories and provide courage, spirit, and love. Please feel free to comment on any of our Posts or Pages. If you would like to share photos or personal thoughts, please email thinkjohnbradley@gmail.com. We would love to have you follow our story. Just enter your email address to follow this blog and receive notifications of new posts by email. We are so proud to have joined forces with The Cure Starts Now, a foundation focused on funding laboratory and clinical research aimed at understanding and ultimately curing DIPG. Please click on the logo to be directed to the CSN website. JBT support bracelets, stickers and t-shirts are available for donation, please email thinkjohnbradley@gmail.com for more details.